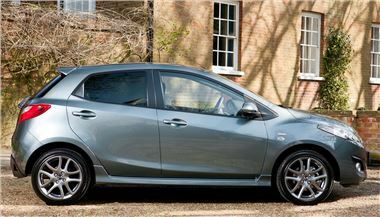 Mazda has introduced a high spec special of the Mazda2 called ‘Venture Edition', priced from £12,995. The Mazda2 Venture Edition is based on the 5-door Mazda2 Tamura hatchback with a premium cabin ambience. This includeds a Sanyo TomTom navigation system with a 5.8-inch touch screen, integrated Bluetooth® hands-free kit, climate control air-conditioning, privacy glass and electric rear windows. There are six special exterior colours, including Dolphin Grey and Burgundy Red. Externally the Mazda2 Venture Edition 16-inch gunmetal alloy wheels with 195/45 R16n tyres, sports styling kit, front fog lamps and a rear bumper sports trim. The Mazda2 Venture Edition costs £1,000 more than the Tamura. Just 1,500 examples of the Venture Edition will be made, finished in the two unique colours - Dolphin Grey Mica and Burgundy Red Mica and four from the regular Mazda2 range - Crystal White Pearlescent, Brilliant Black, Aquatic Blue Mica and True Red. The Mazda2 Venture Edition model also benefits from the standard equipment level of the Tamura which includes: front, side and curtain airbags, remote central locking and dead locks, driver's seat height adjustment, leather steering wheel with audio controls, CD radio with Auxiliary jack and four speakers, 60/40 split folding rear seats and a Thatcham Category 1 alarm. Owing to its lightweight construction, the Mazda2 combines spirited performance and remarkable fuel economy with outstanding handling and driving dynamics, for a truly spirited sporty drive in the best tradition of the Japanese brand. A stiff bodyshell, softer mountings for the rear trailing arms and re-tuned rear dampers give the 2012 Mazda2 superior road holding and ride comfort. The Mazda2 Venture Edition, which is powered by an 84ps, 1.3-litre MZR petrol engine, accelerates to 62mph in 13.6 seconds, returns 56.5mpg (combined cycle) and has a CO2 emission rating of just 115g/km. This model also qualifies for zero road tax (first year rate).